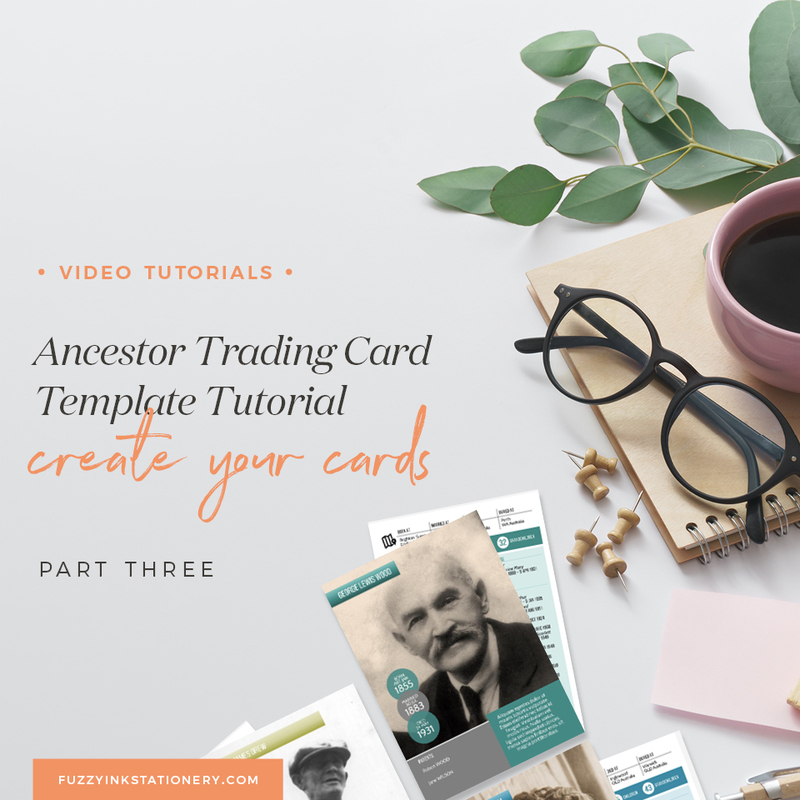 I think most family history enthusiasts look for ways to make ancestry exciting and engaging to the next generation. We’ve shared our discoveries with polite yet bored audiences to no avail. After all, we are proud of what we’ve found. But what took us so MANY research hours to discover, can be hard for others to digest all at once. Entertaining family can be hard and so educating them about long-dead relatives can seem like a difficult task. Even when someone is keen to know, it’s impossible to impart 20+ years of research in a few afternoons. And that is why I often talk about creating games starring your ancestors because they can both entertain and educate. I’ve previously explored adapting an existing game that you already own, but what about creating something new? Now I’m not talking about an elaborate game board and scoring system. Let’s stay simple. It should be easy to put together and encourage your competitive relatives to study up about their ancestors. What are we making? 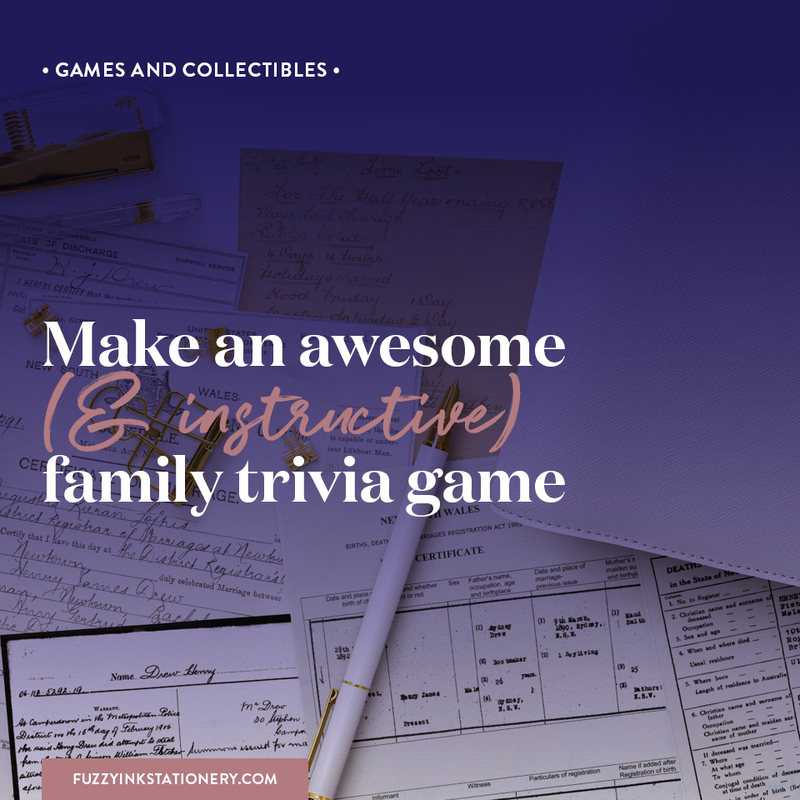 A family trivia game. The rules? Whatever you want them to be. The style of play? 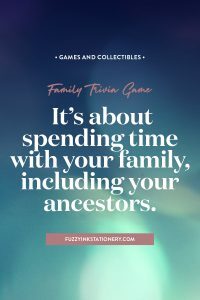 That’s up to you because this game is going to be as unique to your family as your ancestors are. Well sure, if you start out focusing on ancestors who died multiple decades ago, then you’ll quickly clear the room. Your family don’t know those people, they can’t relate to them, and they’ll never be able to answer the questions. How is that fun for anyone? Therefore, you will need to be strategic in your approach. After all, you don’t start school and suddenly have to write a 1,000-word essay for homework. First, you learn to write and eventually the expectations expand to help you continue to grow. So, let’s steal that approach and apply it to sharing our ancestor’s stories. When I was a kid my favourite game was ‘Post Office’. My sister came up with this idea where we all had ‘mailboxes’. A fancy name for what was an envelope at the foot of our beds. And the premise of the game is that we would send and receive mail. Therefore we wrote letters to each other, and she delivered them. It’s so simple, right? Of course, Mum used this as an opportunity to remind us to do our chores, but that didn’t matter. In fact, it wasn’t about what was in the letters at all. What I loved was that it was about us. 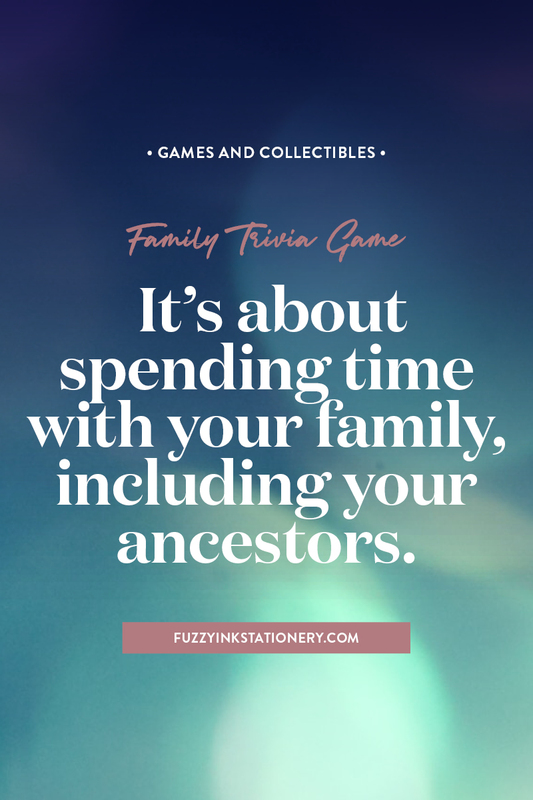 A family trivia game isn’t a substitute for storytelling, but an introduction to shared ancestors. It’s an opportunity to learn the more remarkable facts about someone rather than everything about them. After all, you wouldn’t sit next to a stranger and start telling them your life story, would you? The aim is to share facts in easily digestible snippets. Hopefully, these nuggets of information will hint at a bigger story to encourage your relatives to ask questions. For example, the family trivia game might ask ‘who has the middle name Rainbow’? And it doesn’t matter whether or not anyone knows the answer. The real goal of the question is to get your relatives to ask you about the unusual middle name. So, get your genealogy research out and look for interesting facts such as unusual names, place of birth, occupation etc. Not only is this particular game flexible in how you play, but also in what you use to build it. Be as fancy or as simple as you want. You can create game cards, a scoreboard, team hats – whatever you think will help make it more enjoyable. But you can get also use just pen and paper to write out the questions and keep score. 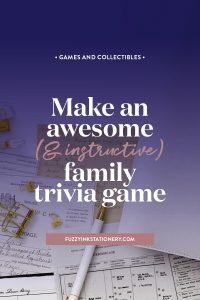 I’ve created a unique Family Trivia Game Planning Worksheet as your starting point. Work out the rules, how to play, and the question categories. 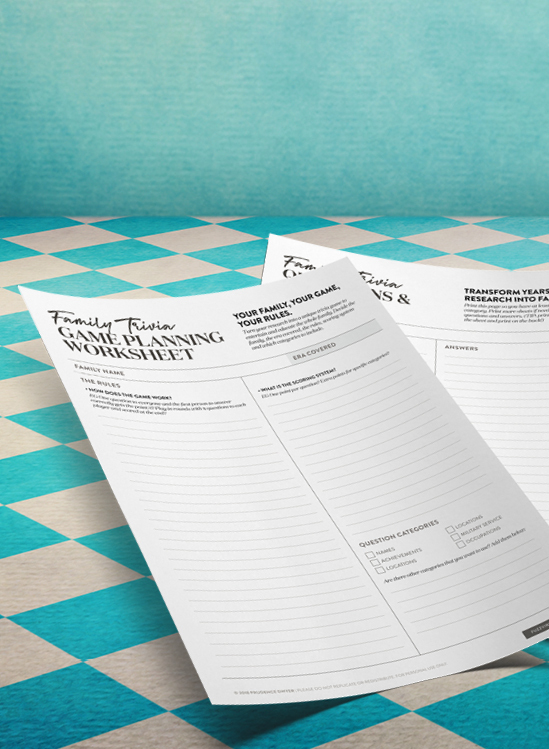 Then print out a handful of the Family Trivia Questions & Answers sheets and get to work. Whether you read directly from the worksheet or create game cards is entirely up to you. 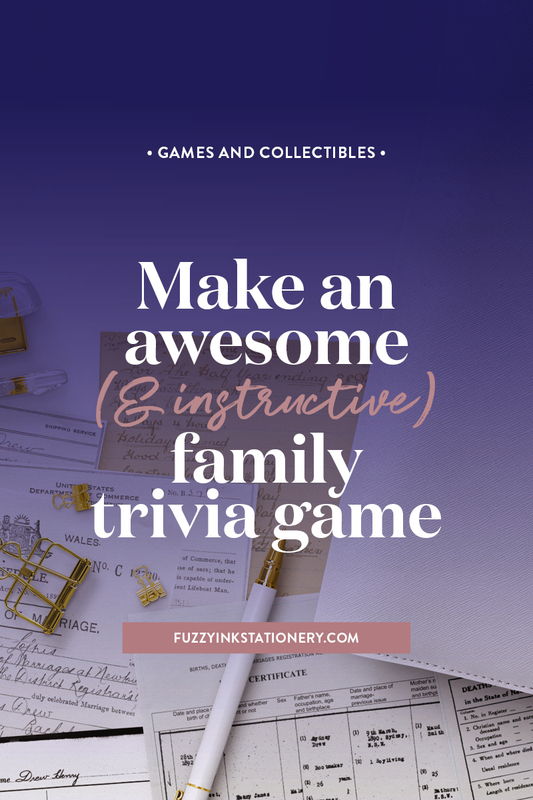 The Family Trivia Game Planning Worksheets include suggestions for categories from my research if you aren’t sure where to start. However, I recommend looking for themes when you are reviewing your research looking for questions (EG military, occupation, achievement). Those themes will become the categories for your game. Another great thing about this idea is that you can adapt it to suit different occasions. The rules and method of play can be quickly (and easily) altered to fit the event. So you can create a game suitable for four players or 200 without much more work. Are you planning a family reunion? 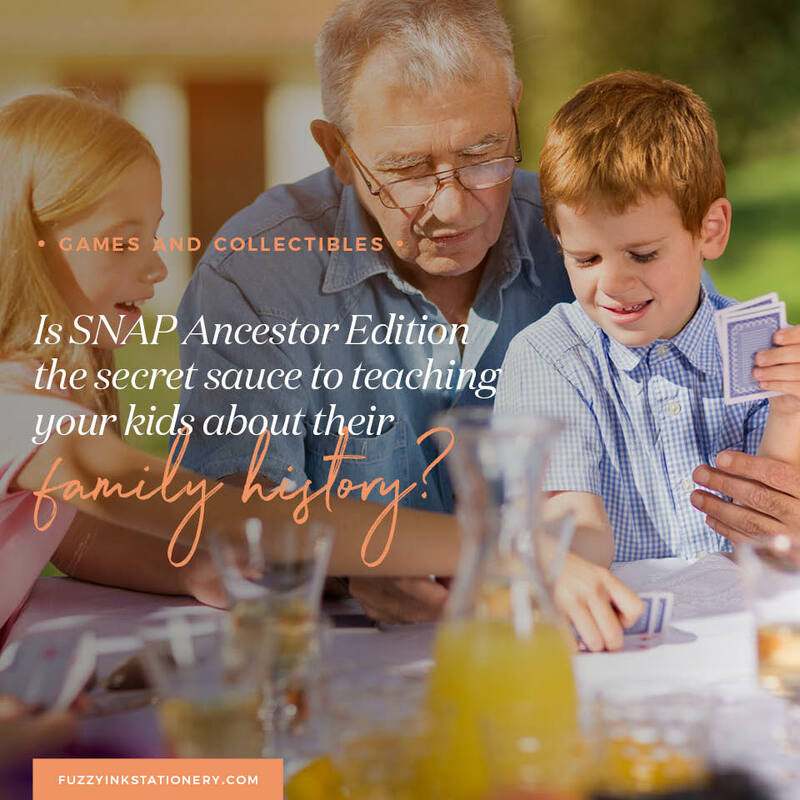 Then you’ll want the Ancestor Edition of the family trivia game. The questions would focus on all generations of that specific family line. Set it up as a team event and choose how the players get the questions. Will there be one question every hour? Or will the game be a scheduled activity where everyone gets the same questions at once? Another idea is to have a scavenger hunt where the players solve clues to find the questions. Another special edition could be for a milestone birthday or anniversary. For this version, all the questions would focus on that specific person or couple. Again, ask everyone the same questions at once so they can call out the answers. The couple (or person) can score those responses. Or provide the participants with worksheets to write on and let them work as teams or individuals. There are so many ways to adapt the game to suit your purpose. Once you have the questions, how you play is entirely up to you. Your family, your game, your rules. There is no maximum number of questions that you can have for the game. I’d recommend aiming for 100 questions to begin with because you can always add more later on. That will help to keep the content fresh so that your competitive relatives can’t just memorise the cards. Instead, you want to inspire everyone to learn more about their ancestors. 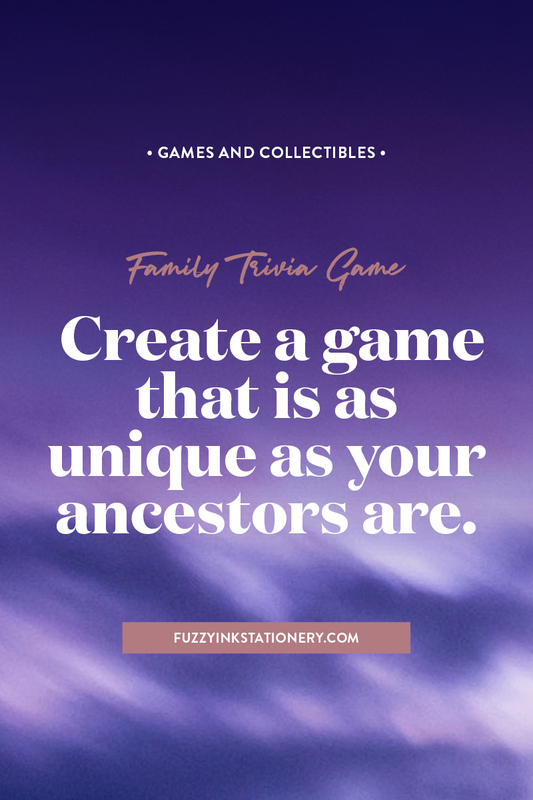 However, you decide to you approach creating your family trivia game, remember to make it fun. Not just for the game participants but also for you as the creator. Designing games is a complex task, but this one doesn’t have to be. Keep in mind that trivia doesn’t need to be fancy unless you want to invest the time. It’s about spending time with your family, including your ancestors. After all, why leave them out of the fun? And it gets the conversation going about those who came before us. I like to choose obscure facts that people aren’t likely to know because they get everyone talking. I do have a relative with the middle name Rainbow, and he was born in the late 1890s. So not the time that comes to mind for such an unusual name. It’s been the topic of many family discussions as we’ve tried to work out where they got that name. What have you done to get your relatives excited about their ancestors’ stories? 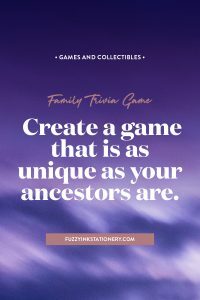 Have you created are family history game? Would you rate what you have tried as a hit or a miss? ​​​I'd like to hear more from Fuzzy Ink Stationery. 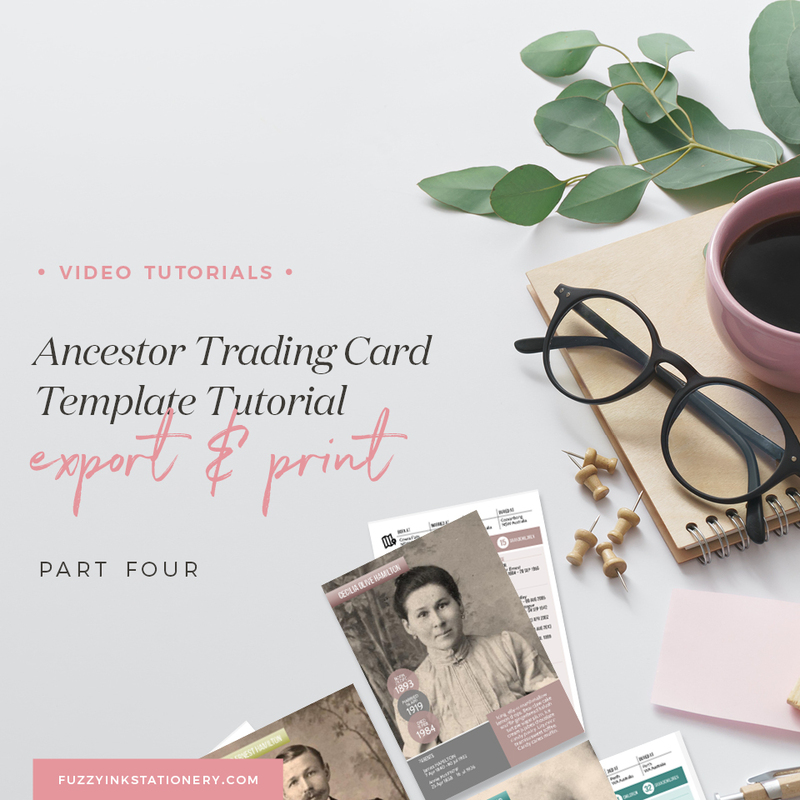 Please send me email updates about genealogy and storytelling, templates, and training as well as ​any subscriber-only special ​offers.